According to the EY Global Banking Report titled “EY Global Banking Outlook 2018”, 85% of banks globally cite implementation of a digital transformation program as a business priority for 2018, with greater investment in technology to drive efficiency and growth. Managing evolving risks is also viewed as critical for sustainable success. Globally, addressing cybersecurity is the top priority for banks (89%) in 2018, replacing last year’s top priority of managing reputational, conduct and culture risks, which falls to sixth place in this year’s report. Recruiting, developing and retaining key talent (83%) also garners significant attention as banks strive to integrate cyber experts into their organizations amid a shortage of skill sets. The EY Global Banking Report further found banks in developed Asia-Pacific markets, such as Hong Kong, Australia and Singapore, are focusing on developing partnerships with FinTechs, investing in technology to reach customers and improving risk management, with 82% listing these as their top business priorities for 2018. Meanwhile, all respondent banks in the emerging Asia-Pacific markets surveyed (Mainland China, India, Indonesia and Malaysia) list their top priorities for the year as implementing a digital transformation program, gaining efficiencies through technology, and enhancing data and cyber security. “The majority (75%) of banks in the developed Asia-Pacific markets and half (50%) of banks in the emerging markets also stated they are planning to set up new partnerships or JVs in their core markets in 2018. 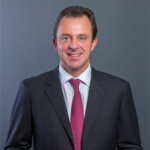 So we are likely to see greater collaboration between Asia-Pacific banks and e-commerce or other technology platform players, particularly as open banking reforms progress in markets such as Australia, Hong Kong and Singapore,” says Jan Bellens, EY Global Banking and Capital Markets Deputy Sector Leader. 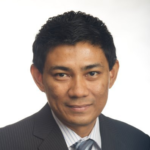 Shankar Kanabiran, Partner and Malaysia Financial Services Banking & Capital Markets Advisory Leader, Ernst & Young Advisory Services Sdn Bhd, says, “All of the banks surveyed in Malaysia have similarly identified recruiting, developing and retaining talent as one of the top priorities, with digitalization and other market demands pushing for new or upgraded skills from the workforce,” continues Shankar. The survey of senior executives at 221 banking institutions across Asia-Pacific, Europe, North America and emerging markets found that just 4% of banks across developed markets in Asia-Pacific currently view themselves as being digitally mature or digital leaders. In comparison, 27% of banks in North America and 15% in Europe consider themselves as being digitally mature today. On the European and American end Bellens says this may indicate that American and European banks are benchmarking themselves against traditional competitors, while banks in the developed Asia-Pacific markets of Australia, Hong Kong, Singapore and Japan are comparing their maturity levels with those of emerging competitors, who have more digitally focused business models. “Asia-Pacific has a much higher penetration of digital and mobile technology adoption than many other regions. Mainland China, for example, has the highest rate of FinTech adoption in the world and many of the big cities there are effectively operating as cashless environments. Compare this with the US, where cheques are still prevalent and the relative benchmarks for financial digital maturity look quite different,” he added. 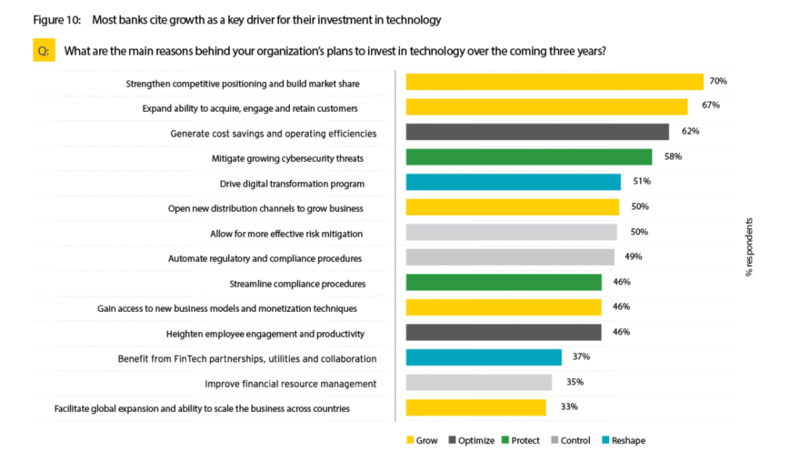 With the fintech companies becoming increasingly aggressive globally and mushrooming in local marketsalongside competitors strengthening their technology portfolio it is no surprise that 70% of the bankers surveyed cited that strengthening their competitive position is one of the key reasons to to invest in technology. The other reasons cited in the report are also the usual suspects and are not untypical reasons for banks to invest in technology. 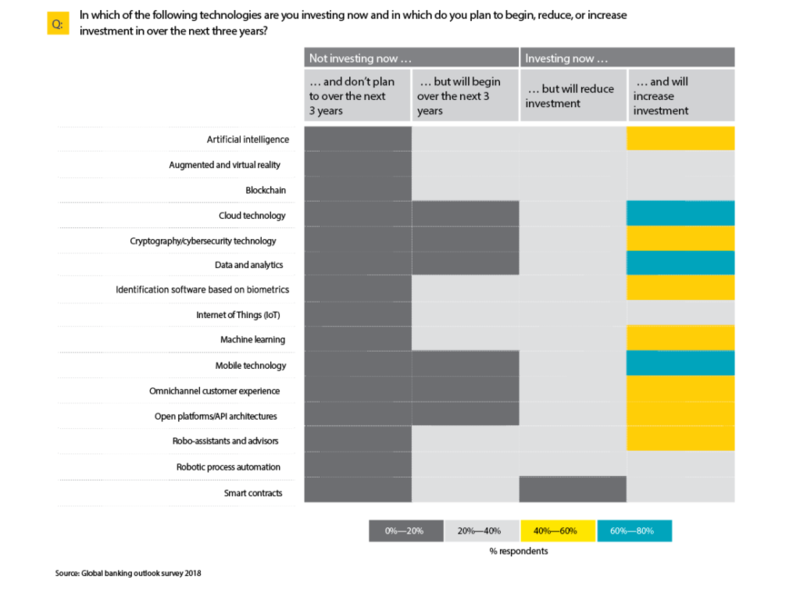 The EY Global Banking report also indicates that in terms of prioritisation of technology investments the report has shown the key priority is Data Analytics, Cloud Technologies and Mobile Technologies with the secondary priority being Artificial Intelligence, Cybersecurity, Biometrics, Machine Learning, Omnichannel Platforms, Open APIs, Robo Advisory and Robotic Process Automation (RPA). Interestingly despite the hype around smart contracts the report indicates that the banks are not investing in the next 3 years and those who are already investing in it will be reducing their investments. An interesting observation from the report is that much of the bankers are not putting the money where their mouth is seeing as how 89% of them cited that cybersecurity is a top priority for their bank but only 40%-60% are increasing their investments into it. “Ten years after the global financial crisis, banks are experiencing increased competition from a range of new market entrants and evolving risks that challenge their ability to deliver sustainable profitability. In order for banks to weather the performance challenges that lie ahead, they must emerge from an era of regulatory-driven transformation and prepare new strategies for a future led by innovation and technology,” Bellens concludes.